Can you believe it?! 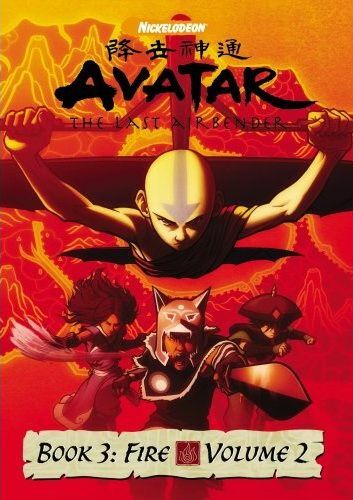 The third season of Avatar: The Last Airbender is now halfway through it's DVD release! In Book 1: Water, Aang took on the challenge of mastering waterbending, and in Book 2: Earth, Aang suffered through the challenges of learning earthbending, so in Book 3: Fire, we'd expect him to start studying firebending... but that's kind of hard to do when the Fire Nation is at war with the rest of the world. So the label of Fire for this season comes not from the type of bending Aang is going to learn, but from what Aang and the gang are going to do... and that is taking on the Fire Lord! Although I missed volume 1 of book 3, the continuity isn't too hard to pick up. Somehow, the gang snuck into the Fire Nation and are now posing as loyal members of the Fire Nation. The day of the black sun is near, which is an eclipse that they learned about in the previous season, and since this event will cause all the firebenders to loose their bending while the eclipse is taking place, Aang and pals set up plans for an invasion to coincide it. Unfortunately, has not yet mastered the extremely powerful avatar state, and in fact he can't even enter the state at all. So it would seem that Aang may not quite be ready to take on someone as powerful as the Fire Lord, even if the evil one would loose his powers for several minutes. But the plans are already set, with members of the Earth Nation and Water Nation joining in the battle, and Aang feels it must be done. So while they wait for the fateful day to arrive, they basically just hang out and have little adventures. But the first episode, "The Avatar and the Firelord", is a bit different, as it tells mainly of the story of how the previous avatar, Avatar Roku, used to be best friends with Fire Lord Sozin. The story is revealed to both Aang and Prince Zuko, but through different sources, and it even shows the genesis of the Fire Nation's war on the other nations. In the second episode, "The Runaway", Toph, Aang, and Sokka discover the art of scamming people out of money using Tophs earthbending talent. At first they simply con those who attempt to scam others, but soon things start going too far, and Katara is worried that bad things will come of it. And she's right, but in an unexpected twist it's not Aang, Sokka, or Toph's idea that leads to trouble, it's Katara's! The third episode, "The Puppetmaster", finds Katara and Sokka amazingly stumbling onto a waterbender from their own Southern Water tribe. Hama, now an old woman, was captured by the Fire Nation long ago, but eventually escaped and now lives among the Fire Nation as one of them. There are also stories about how people disappear from the forest at night. Think there's a connection? Episode four, "Nightmares and Daydreams", does a fantastic job of capturing the feel of nightmares, dreams, and insomnia. Aang is worries that he is not yet ready to take on the Fire Lord, and thus every time is falls asleep he is assaulted by nightmares of failure. Eventually it becomes so bad that he can not sleep at all, and thus his mind starts to play tricks on him. If Sokka, Katara, or Toph aren't able to get him to relax, Aang won't be of any use when the time for attack arrives! The final episode on the disc is "The Day of Black Sun, Part 1: The Invasion". Seems like we've been waiting for this day ever since the series started, and it doesn't disappoint. The assault on the Fire Nation begins, but as the title indicates, this is only the first episode. The conclusion of the battle won't be revealed until the next disc (unless, of course, you have already watched it on television). Every episode on this disc is of the same high quality we've come to expect from Avatar - The Last Airbender. And it's fantastic that they include 5 full episodes on each release. For extra features, there is an audio commentary by the creators and crew. I haven't checked that part out yet, but you can bet I will. Once again, another superb release!